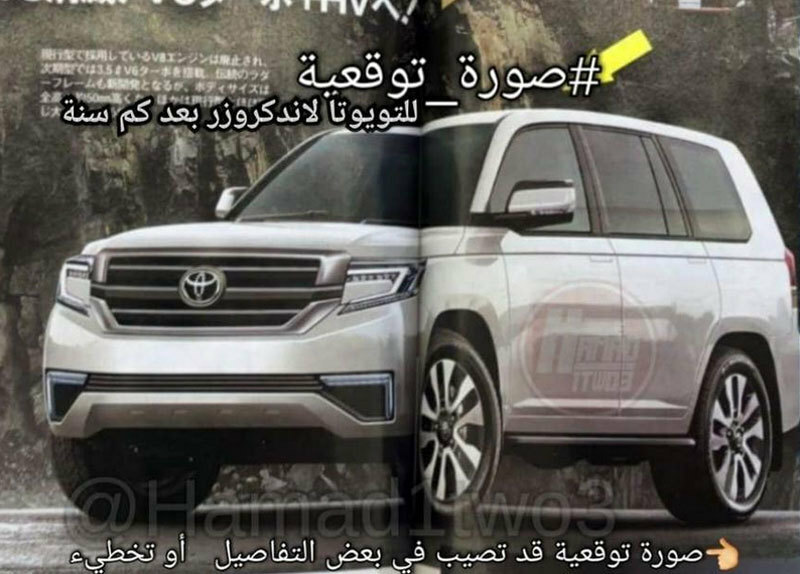 The scans of the picture along with the technical characteristics of the newest Land Cruiser, rumored to have been published by a Japanese magazine, spread throughout the Internet. Teasers make it clear that the Toyota Land Cruiser 2020 will have more streamlined body shapes, LED front optics and another radiator. It remains unclear and on account of how a brand new Land Cruiser can be, completely new or updated. Dimensions of the new machine are similar to the current Land Cruiser 200, making a length of 4.95 m, a width of 1.98 m, a height of 1.92 m with a wheelbase of 2.85 m.
The novelty will be driven by a compact petrol V6 with a turbocharger of 3.4 liters per 422 horsepower. In a pair of motors will introduce a 10-speed automatic transmission. In equipping, cars are expected to be wirelessly charged to mobile devices Avion Wireless Qi, new onboard multimedia, and in the cabin will be a different steering wheel, chairs, and decoration materials.